Once upon a time there was a girl. She was traveling to Boston for business. Alas! On her first flight she finished the only magazine she brought for reading. Her trusty nook did no good during the all electronic blackout. Wandering through the city a few days into her trip, she wished she could happen upon that large Borders she had run into the last time she was in Boston. Like a wish granted from a fairy, she turned the corner and there it was! Now, this girl was cheap and in lots of student loan debt, so she didn't often buy books. She had to make a good choice. What to buy? Pulling out her Goodreads app, she flipped through her 300+ "To Read" shelf, mentally crossing off choices that could be easily purchased from a discount store or things that she could just get from the library. All too soon, the announcement came over the loudspeaker announcing the close of the store. She would have to chose fast. "Beauty" she thought "I did really want to read that." Minutes ticked by as she tried to find the book. Not in fiction. YA maybe? She couldn't even find the section! Giving up, she grabbed her second choice and headed for the counter. That's when the saw the YA sign, and sure enough, nestled in between what was sure to be two books about teen vampires, was one copy of "Beauty". Beauty and the Beast is a story you have heard before. I know it. I would bet money on it. The story itself is in so many forms and media these days that you would have to live in a cave to not be exposed to some sort of adaptation or inspiration. But how many of us have gone back to read the actual fairy tale? I have to admit, I haven't either, but this book is a pretty close second. Beauty is a retelling. They tell that to you in the title. So going into it and hoping there will be a fresh twist is setting yourself up for disappointment. For me the joy was watching another version of this beloved story unfold. Beauty is the daughter of a merchant who, upon losing his shipping fleet, must move into the country with his three daughters. The first part of the book follows them and their life. The second half deals with the Beast and his castle. So how does it compare to my favorite Disney movie? There a moments where I was seeing the movie through Belle's eyes, others where I could see where Disney was inspired and still others where I was surprised at how different it was. For instance, Beast's clothing has ruffles and lace. Yay for that mental image! While I normally am not a fan of first person POVs, I didn't mind it here. It gave it a more personal feel than third person would have. It was a good choice at distancing it from the source material. In summary, this is a quick, little romantic read. It's nothing new, except for the feeling behind it. The focus is on Beauty as a person and the relationship she has with her family, herself and the mysterious Beast of her dreams. If only we can always have a Borders pop up when we need it and deliver us just the book we were looking for. If only there was a floating bookstore for all those situations in life. Also, I love your story of how you obtained Beauty. And YAY, so so so glad you loved this one. Robin McKinley is one of my favorite authors so it makes me happy when other people enjoy her books. I'm so excited to see this book reviewed! 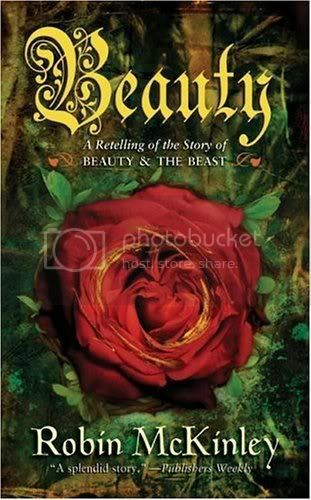 I absolutely adore Robin McKinley and her re-telling of Beauty and the Beast. That last comment on Borders popping up...yeah, basically perfect. I've been considering this book for a while now. Since Twilight made it okay for Moms to buy YA books, maybe I need to go check it out. Also, loved the story of finding the book.